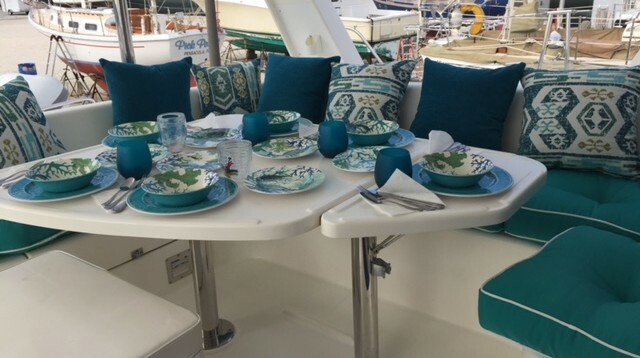 A Leopard 43 catamaran is a true blue-water cruiser featuring a full-batten, self-stacking mainsail, 120 percent roller-furling genoa, and twin 40 hp diesel engines. She provides a stable platform, and a tremendous amount of space on deck and below. 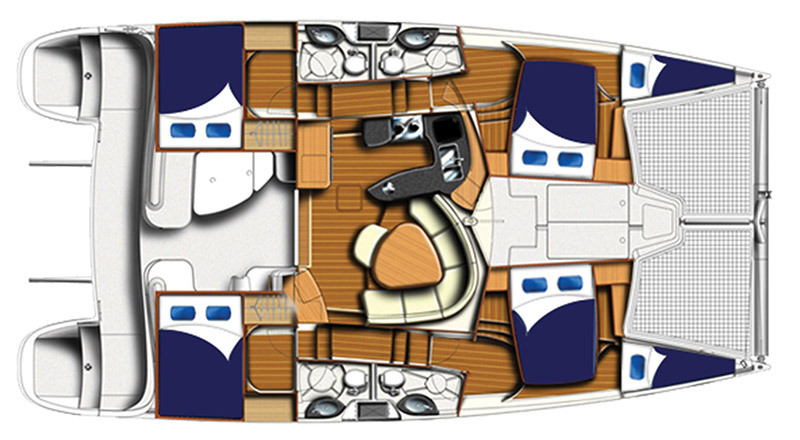 The cockpit has 360 degrees of visibility from the double helm seat and a hardtop bimini provides shade. 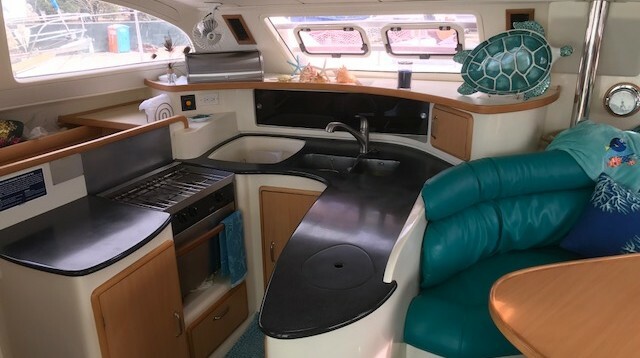 The cockpit has walk-through access to the swim platforms, a full electronics package, stereo/CD player speakers, a large drop leaf table, and lots of seating. A wide door opens to the luxurious saloon and the rest of the interior. The brightly lit and well-ventilated saloon is finished with relaxing neutral colors and carefully fitted cherry joinery. There’s a good-sized galley, and a small nav station. 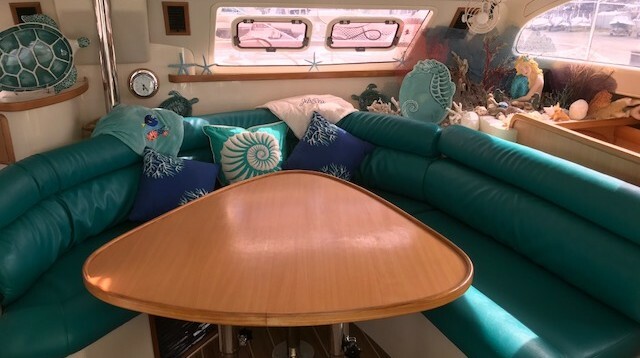 To starboard is a plush curved settee and a large dining table that optionally converts to a cozy double berth. The adjacent galley has all amenities and plenty of counter space. 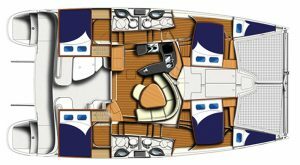 Below, Oasis has four luxurious double staterooms with en suite heads and showers, and forward in each hull are optional single berths. There is ample storage space throughout. Shore power air-conditioning is a delight when at the marina. In our 4-cabin version, each cabin has its own head. There are extra sleeping areas available. 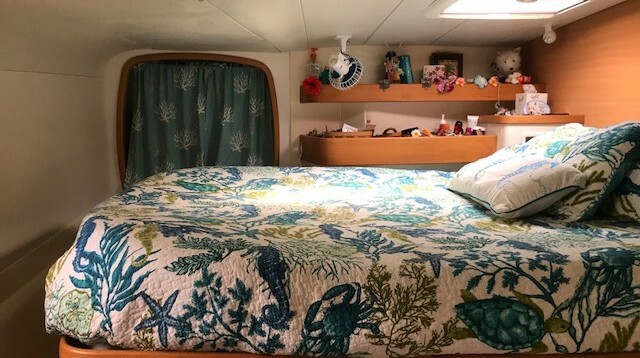 While you can cram extra people (kids in particular) into the extra berths in the bows, or on the converted saloon table (for a total of 12), you and your crew will be more comfortable if you keep it to 8. Contact WCM to join our Sailing Club for discount bareboat charter rates.